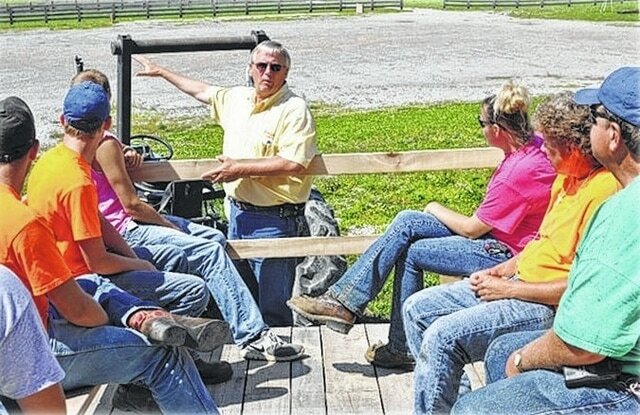 Ray McKinniss entertains guests at Bobs Evans Farms Inc., where he has worked for the past 35 years — the past 20 as its manager. McKinniss will be grand marshal of Gallipolis’ Independence Day parade on Saturday. GALLIPOLIS — A familiar and well-known face in Gallia County will serve as this year’s Independence Day parade marshal. Ray McKinniss, farm manager at Bob Evans Farms Inc., will serve as this year’s parade marshal. As is customary, the yearly winner of the Bud and Donna McGhee Community Service Award is also named parade marshal. McKinniss was this year’s recipient of the award, which he received earlier this year at the 78th annual Gallia County Chamber of Commerce Meeting and Awards Banquet. The parade is slated for 7 p.m. Saturday in downtown Gallipolis. McKinniss has been actively involved in the tourism industry for more than 30 years. He joined Bob Evans Farms Inc. about 35 years ago, and has been farm manager for 20 of those years. During that time, he has worked with the Gallia County Chamber of Commerce, serving in many capacities: board member, president, member of the River Recreation Festival Committee, serving four times as chair of the Festival Committee and much more. The planning and implementation of the Bob Evans Farm Festival, held annually at the farm near Rio Grande, Miller said, reflects his expertise. The Bob Evans Farm Festival attracts hundreds of people from not only from around Ohio, but from surrounding states West Virginia, Kentucky, Pennsylvania, Michigan, Indiana, Illinois and beyond. The chamber has been involved with Ohio Chautauqua each time Gallipolis is the host city. McKinniss was chairman and founding member of the Gallia County Ohio Chautauqua Committee and was instrumental in securing Ohio Chautauqua visits in 2006, 2008, 2010, 2012 and 2014. The next visit is already scheduled for 2016. Miller said his influence goes far beyond Gallipolis and Gallia County. McKinniss serves on statewide boards for the Ohio Travel Association and Ohio’s Appalachian Country. He has also, for the past 30 years, been a part of the Heartland Travel Showcase, a yearly convention-type event that brings hospitality industry professionals together to promote travel destinations in several U.S. states and Canada. A native of Wellston, McKinniss is the son of Barbara and the late Bernard McKinniss. He was raised in a family dedicated to civic involvement. His parents were the owners of the Wellston Telegram and Telegram Printers. He graduated from Rio Grande College in 1976 and worked there for the next four years, first as a recruiter in the Admissions Office, then as director of alumni. In 1980, he joined Bob Evans Farms Inc., in their management program and held a number of positions with the company until 1995, when he became manager of the farm in Rio Grande. He and his wife, Terri, have three sons: Heath and his wife, Melissa; Justin and his wife, Brieanne, and Travis and his wife, Kaley. They also have four grandchildren: Garrett, Carsen, Audrey and Hadley. During the time his sons were in school, McKinniss was involved with their sports games, scouting and church. He was an Eagle Scout himself, coached Biddy League teams and was a scorekeeper over the years for various teams. He also has served on many church committees. Much of the information for this story was provided by the Gallia County Chamber of Commerce.